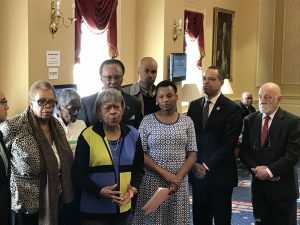 At a Tuesday morning press conference, Senate Finance Committee Chair Delores G. Kelley (District 10 – Baltimore County) detailed legislation that would alter Maryland’s parole system to remove politics from the process and leave parole decisions solely to the discretion of the Maryland Parole Commission or the Patuxent Board of Review. The legislation would be limited in scope and require the person paroled to have served 30 years, without the application of diminution of confinement credits. In her remarks, Kelley stated: “Governors don’t need to step in to make a political decision.” “This (the parole process) is not a role that Governors should be involved in. “Two of our recent former Governors both Ehrlich (a Republican) and Glendenning (a Democrat) stated that change should have come in their tenures.” Kelley offered that the state should take the advice of these former officeholders and achieve this goal. “Change is long overdue,” she stated. Scheduled to be heard today in the Senate Judicial Proceedings Committee, Senate Bill 121 is being considered concurrently in the House of Delegates with House Bill 443 (which will be heard in the House Judiciary Committee on February 19th).